Yes you heard it correctly! Deer antlers along with many other types of antlers like moose, elk and caribou are making the best dog chews you can buy. Move over rawhide there's a new chew in town and it has people running to there phones to order some! 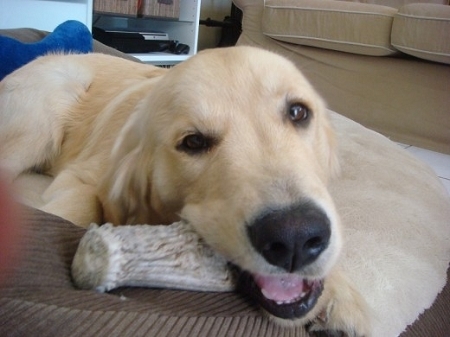 Antler dog chews are all organic and come from a renewable source called shed antlers. The deer,elk and moose grow there antlers through out the spring and summer months and shed them in the late winter and then start to regrow them in the spring. How's that for an all natural organic dog chew? Not to mention they don't smell or stain your carpet. They last a long time and are full of minerals that are great for your dog and they will also clean your dogs teeth better than any other chew on the market! They also do not splinter like many other dog bones on the market. Dogs love the raw all natural smell and feel of antlers they are naturally attracted to them. The outer part of the antler is a type of enamel that when chewed on by a dog breaks down just right so that it lasts a long time and yet always maintains that wild attraction and taste that the dogs love so much. Inside the antlers underneath the enamel is a less dense substance very similar to bone marrow in fact its almost identical. The dogs try to get to it as quickly as possible. Its hard still but is porous and has thousands of little holes running through it created by the blood running through the antlers when in the growing stage also known as the velvet stage. The antlers are grown in the velvet stage and are a soft growing tissue during the summer months but in late summer early fall the deer,elk moose and caribou go through a hormonal change and the velvet stops growing and the antler turns to hard bone. They then scrape there velvet off on the tree's and bushes and whats left it solid antler! Try some today your dog will love you! Sizes and shape vary as this a natural product-but your dog will love the chewing! Antler size varies in circumference as well as length, we will select an antler appropriate for breed size given per your selection above. I have two puppies who are chewing machines. These antlers keep them busy without filling their stomachs with rawhide. Best thing I have found for my chewers! I have a black lab who will chew through large rawhide bones in minutes! She has had an antler for 3 months now and chews on it a bit every day...I love the fact that it lasts so long and gives her something to chew that doesn't fill her stomach like rawhide does. Never heard about these until I went on your website. My two dogs are chewers and nothing lasts. These last for at least a week if not more instead of a couple of hours. Great product! Sorry That I only ordered one of these antlers. I have two dogs and they fight over it. They have been chewing on it for over a month and it is still there. Q: What do you get for the price? Large dog is $17.95, is that per piece or do you get a couple pieces for that price? What is the difference between sizes? There isn't enough info on the website to describe what you get within the selections. 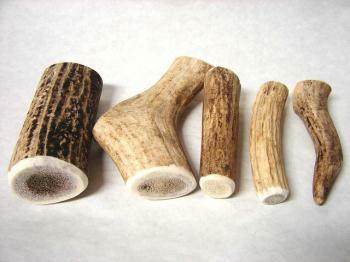 A: The price is for one antler-our price is very competitive, if you shop around they are usually much more expensive. The sizes vary for various dog breeds and the size their jaw and teeth can handle. The small are for toy and small breed dogs-under 30 lbs-the medium for 30-50 lbs and large for labs, shepherds, Great Danes and large to giant breed dogs. There is a soft marrow inside that dogs chew at the antler to get to-the antlers are very long lasting, we leave them on the floor or by the dog bed as our dogs will chew on them them when bored or anxious. These are really not suppose to be on the rewards program as there really is no way to differentiate points by size unless I list each size separately on the website. This error has been corrected. Sorry for any confusion.